Using WiFi technology, JAM Rhythm & Symphony lets you stream music to any room in your house and control it directly from your phone. Download our free JAM app to stream Spotify, Rhapsody, iHeart Radio, and your personal music library. The new push to talk Amazon Alexa feature allows you to access Alexa through your smart device. Sync up to 8 JAM WiFi speakers for an instant home sound solution — no wiring or installation required. 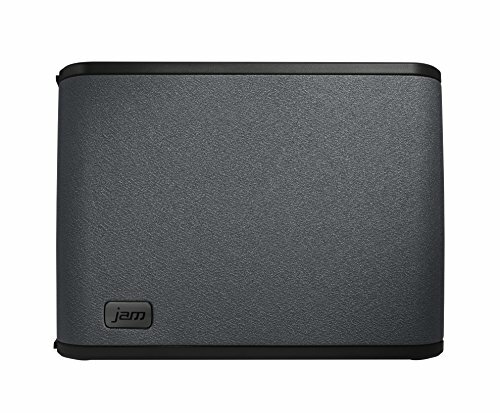 The JAM Rhythm features crystal-clear 2.1 stereo sound with a built-in sub-woofer. It’s perfect for mid-sized rooms, like bedrooms and kitchens. Pair it with a second JAM Rhythm to set left and right channels. The Jam Symphony reatures 2.1 stereo sound with a built-in sub-woofer that delivers immense bass. Dedicated tweeters provide true clarity and excellent high ranges. It’s perfect large rooms, like family rooms and great rooms. The New push to talk Amazon Alexa feature allows you to access Alexa through your smart device.